My Midsummer Sprigs Sampler is back from the framers and I am so happy to be showing it to you. Some mock cross stitch (I've heard it dismissed as "sudoku for crafters") but I find the regularity of the stitches soothing, the way the most organic shapes are reduced to even little squares. Working on the black linen was hard work at times, I'll be honest, and I think all other cross stitches I sew will feel easy after this. But I kept at it because I love it so much, love the way the colours pop and shine against the dark background. I opted to have it framed without glass. This is risky - I'll have to make sure I don't hang it in a sunny spot - but my preference. I love the way I can run my hands over the stitches of the things I've made and feel the bumpy texture. I'm weird like that. The pattern is by the talented and ever-inspiring Alicia Paulson and available here. I followed the pattern instructions for the most part, ordering the stated linen (Cashel) and some of the Weeks Dye Works embroidery threads she recommends. They are lovely because they're variegated, and so the colours pool and change as you sew. But I also bought a lot of the cheaper brands of thread too, like Anchor and DMC, especially for the colours I only needed in small quantities. At the moment it sits on the mantel above the fire place, where the black linen reflects the black stove below. I'll enjoy looking at it here for a while before I hang it elsewhere. Thank you for your brilliant tips and suggestions on how to survive the kitchen re-fit! We are fortunate in that we have a sink and cold water plumbed into the garage, so can wash up there, with hot water from the kettle. So our temporary kitchen will consist of a sink and tap, a small amount of worktop space, camping table, fridge, freezer, microwave, kettle, toaster and slow cooker. Your tips were great though. I'd already thought about eating at other's houses (I'll be seeing a lot of my family over the next few weeks!) and using the microwave and slow cooker, but hadn't considered paper plates, what a flipping good idea. And hot meals at school for the kids every day means that I don't have to worry about cooking them something every night. "Cold Collation" (a cold meal of nice nibbles, like anti pasti) was a new one to me, but I reckon I can give that a go! And things that can be eaten with couscous and bulgar wheat which don't require boiling, only soaking in boiled water - brilliant tip. I am batch cooking like mad, especially meals which can be eaten with those microwaveable pouches of rice or couscous; chilli, curries, and yesterday ten portions of spicy chicken, chorizo and chick pea stew were made and frozen. And I'm not above buying a microwave meal, of course. Or eating the odd takeaway. Hello! Did you have a nice Easter weekend? I hope you feel rested after the bank holiday. Ours has been quiet - we've mostly stayed at or near home - but it's been lovely for that. John had to work two out of the four days but that's not bad, we still got to do some nice things together. As is usual for the UK, the bank holiday weather has been...unpredictable. 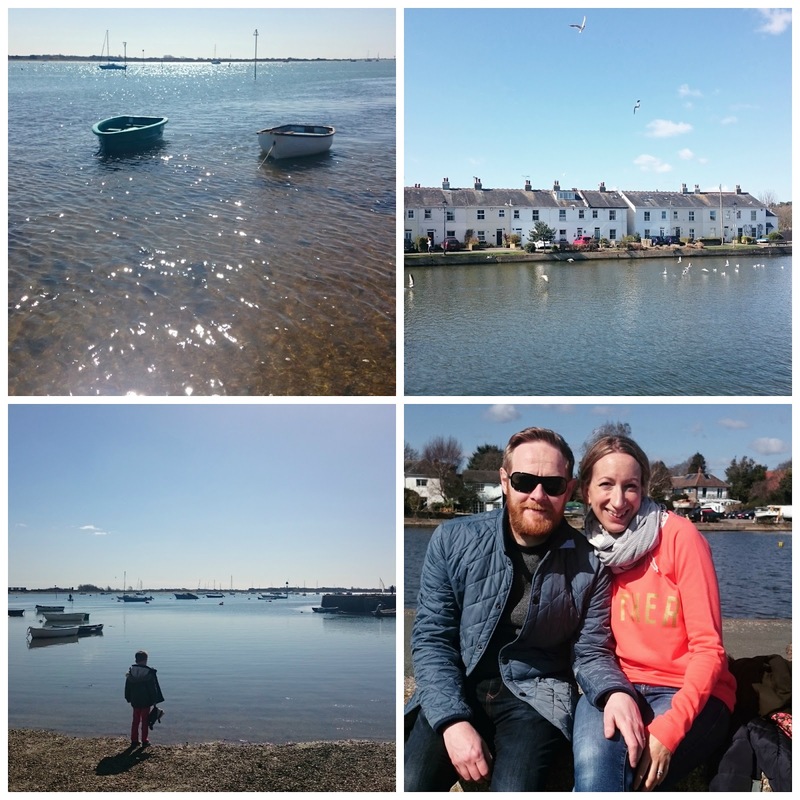 On Friday morning we went for a walk to a favourite place and sat in the warm, still air, watching the sun sparkle and glitter on the water. There wasn't a breath of wind and we even took our coats off. It was just gorgeous. Saturday and Sunday were cold and showery. Then, last night, I think I was woken every hour by Storm Katie. The south-west aspect of our bedroom window takes the full brunt of any bad weather and it's so noisy - between the rain blowing against the glass and the creaking of the window, it's not exactly conducive to a good night's sleep. We have one fence panel down (it needed replacing anyway, perhaps this will push it up the to-do list?) but got off lightly compared to the damage sustained by others along the South Coast. I've been relishing this time at home, sorting, cleaning and washing; I've emptied cupboards and wardrobes, filled four bin liners with old clothes, toys and books for the charity shop, washed all the woolen jumpers...oh, it feels so good. I've been wanting to do this for ages and it was at the top of my Easter to do list. I do love a good clear out, it makes me feel lighter, physically and mentally. I remember, just before we left Leeds, going through the garage, the loft, everywhere, and getting rid of anything that wasn't necessary, and how satisfying it felt to think that everything we owned were either things that we loved or needed, and that I knew exactly where it all was. Well, it's been one year to the day since we moved into this house and I'm slightly appalled at what I've managed to shove into the back of cupboards in that time. Boxes that haven't been opened, clothes that haven't been worn in a year...I was a woman on a mission this weekend. Nothing was going to stand in the way of me and a perfectly folded jumper. 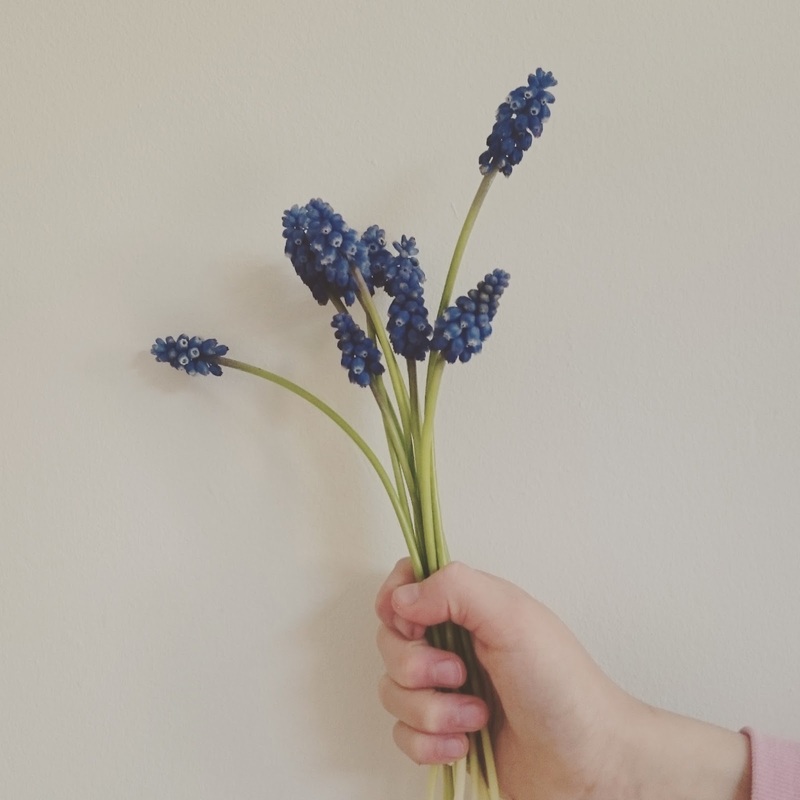 When I haven't been decluttering I've been making and cooking and pottering around, just doing all the other things that make me feel content. At Angus's request I made Barry the Badger a striped jumper. It came out pretty well for a pattern I made up as I went along, and I think he looks quite dapper in it. 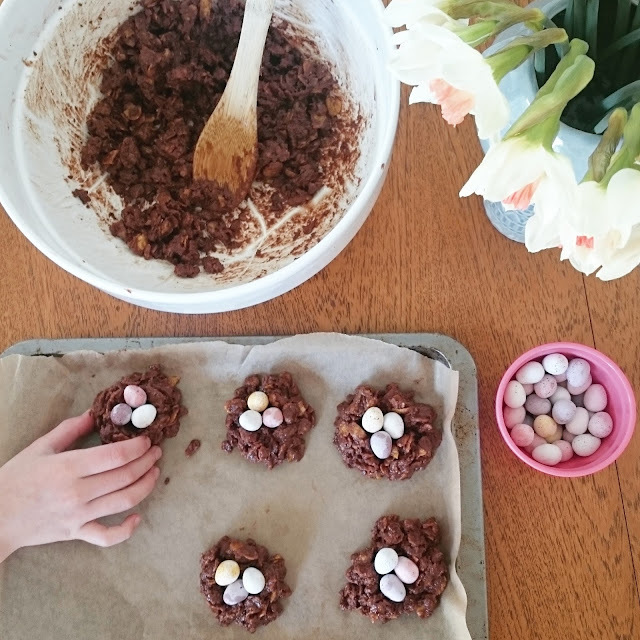 The kids and I made chocolate cornflake Easter nests and picked flowers from the garden. John and I cooked blueberry ricotta pancakes for breakfast on Easter Sunday. They were nice, but not as nice as they should have been for the effort involved. Any pancake recipe that requires me to separate eggs and whisk the whites before folding them into the batter and which uses about four bowls, better be pretty bloody amazing frankly, and these were just Quite Nice. But something we did make which used about 12 eggs (I'm not even joking), every pan and bowl in the kitchen and took all afternoon to make was this spectacular lemon tart. This was our contribution to the "bring a pudding" at my mum's on Easter Sunday. It's so, so delicious, like the best kind of lemon curd you ever tasted encased in a sweet, lemony, crispy pastry case. It's worth every ounce of effort, which is just as well because it is a lot of effort. When I think about eggs at this time of year I don't really think about spring, or fertility, or new life, or even chickens. I think about food, specifically chocolate, more specifically mini eggs. Little nuggets of sweet milk chocolate in perfectly crunchy sugar shells in the prettiest colours, which I've come to think of as Easter colours. I used to prefer Cadbury's Creme Eggs but, I don't know, they're not the same as they were when I was little. Have they shrunk? They definitely taste different. Mini eggs are the way forward. 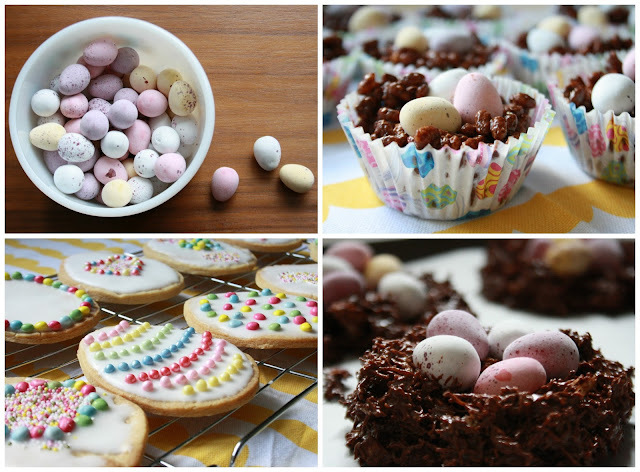 When Angus saw these photos his eyes lit up and he asked if we could make some chocolate nests. Yes, we will definitely be making some over the Easter weekend. We have cereal, chocolate, butter, syrup and mini eggs. It's the most perfect kind of seasonal baking: minimum effort for maximum, tooth-aching satisfaction. 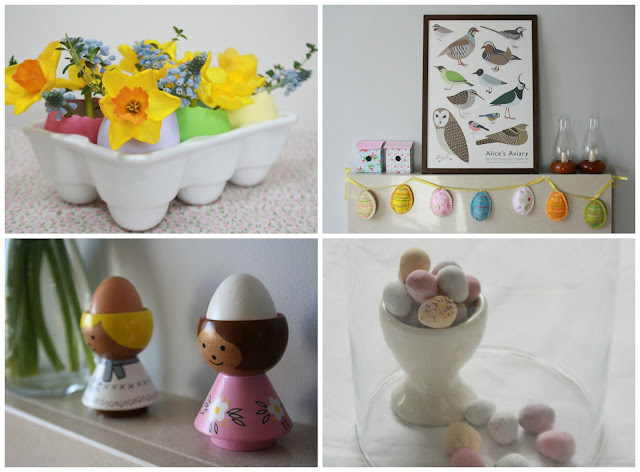 When I went back through all my Easter photos, I was quite amused to notice that eggs also feature quite heavily in my Easter crafting and decorating. Rabbits and flowers too, and the odd bird, but mainly eggs it seems. 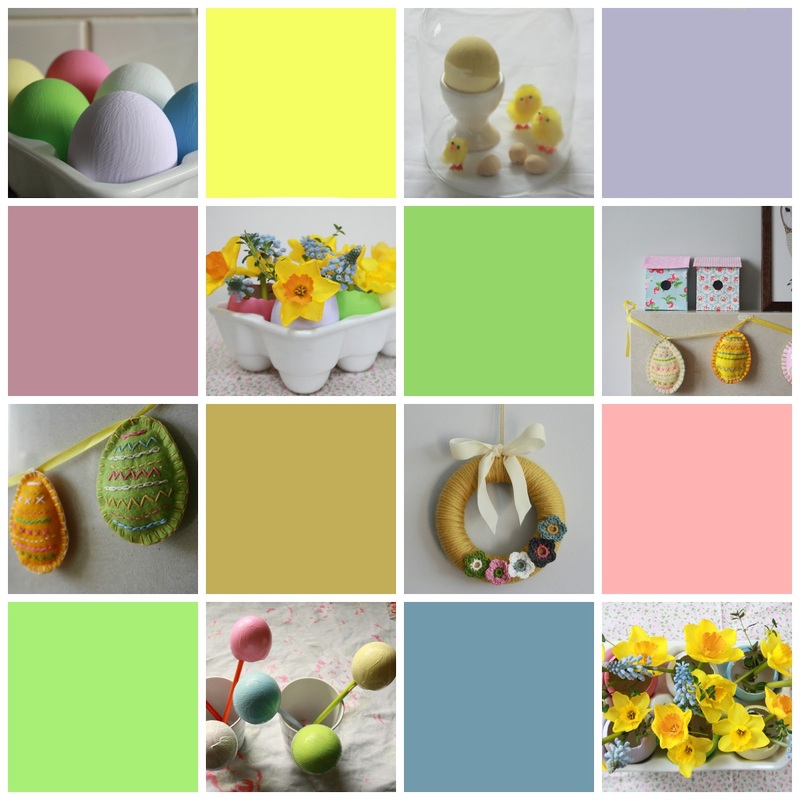 There's something so pleasing about that ovoid shape when matched with those candy pastels. These are not colours I'm usually drawn to, favouring as I do hot pink, mustard yellow or navy blue in both my wardrobe and our home. I find pastels a bit chilly, a bit sickly. But they are everywhere at this time of year, filling the shops, wrapped around chocolates, on the front of greetings cards. A paler, cleaner, more synthetic version of the egg-yolk yellow daffodils, delicate pink blossom, peachy red tulips, blue purple muscari and vivid green shoots and leaves bursting up all over the place. But at this time of year, I don't mind, in fact I rather like it. Bring on the pastels at Easter, in all their sugar coated glory. Are these the colour you also associate with Easter? And, more importantly, would you choose mini eggs or creme eggs? Inspired by Jennifer, I bring you a random collection of things which have made me happy recently. Angus. He has exasperated me lately, but he has also made me laugh and smile a lot, most particularly when he took it upon himself to give himself a hair cut. His fringe was, apparently, annoying him and so he found some scissors and (leaning over his bin - no mess!) hacked away at the offending hair. Just as we were about to leave for a birthday party, I noticed his odd haircut. I couldn't tell him off as I was laughing too much. We called in at the hairdressers on the way home and they did their best. It's incredibly short. When Angus saw it he said "My forehead looks really big now Mummy!" I also had a very, very long overdue haircut, but not a DIY job. I spent last Saturday morning getting my trimmed and coloured and when the stylist dried it, she asked if I'd like the ends curled. Why not, I thought? I had pretty, swishy hair all weekend and felt brilliant. A new hair cut and being about to finally do up my skinny jeans - these things add spring to one's step. Watching the blossom on the ornamental cherry tree in the garden. It's a bit sparse, but beautiful to look at none the less. Bella the bookworm. She was so excited with her pile of library books after Saturday's visit and spent all weekend with her nose in a book. So like me at that age. Watching the light move around the house, especially the bright late afternoon sun which shines longer each day. A recent walk to a favourite spot, always so peaceful. Observing my mum with four of her six grandchildren on that walk. Without anyone saying anything, all children gravitated towards Nana, where they orbited her throughout the afternoon, fighting to hold her hand, asking her things, telling her things, searching her pockets for chocolate buttons. Us parents can only walk along behind. The blossom and blooms, suddenly everywhere. Setting the table with Angus for our Sunday evening meal. Roast chicken followed by sticky toffee pudding. John cooks, I clear up, and kids eat everything in sight. It's one of my favourite things, our Sunday meals, the best way to end a weekend. 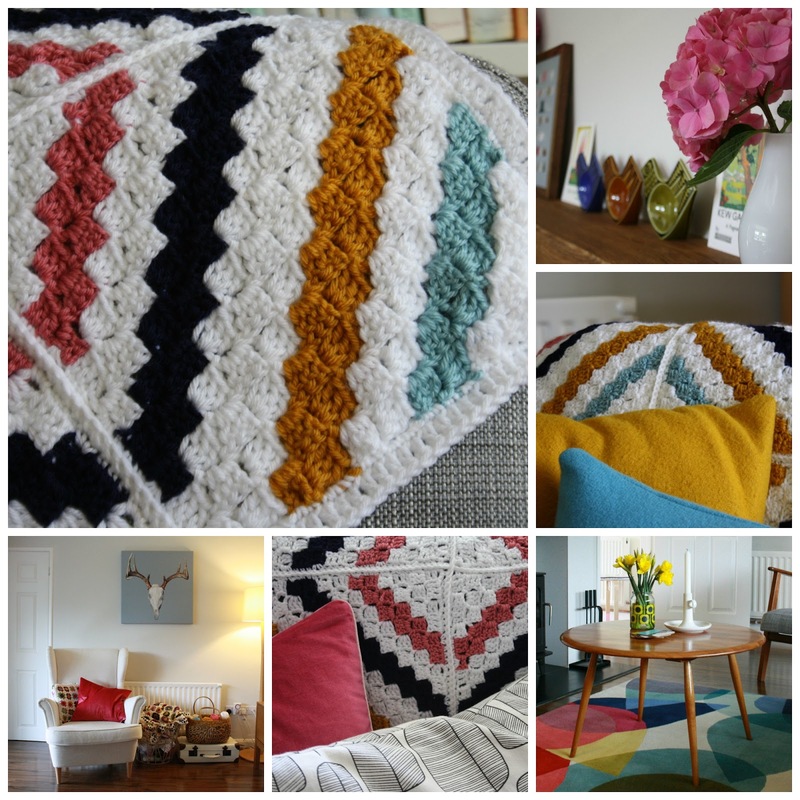 Thank you for your lovely recent comments on our living room and my blanket. I so enjoyed reading them all. I always read all the comments but I am sorry if it sometimes takes me a while to answer questions or emails. As soon as Easter comes I will do some serious housekeeping, blogging and otherwise. I thought I'd show you some photos of our living room. I have been holding back, waiting for it to be "done", but it will never be finished and I wouldn't want it to be either, as homes are evolving things. I've shown you lots of photos of this room before but none since we added the new rug and coffee table to the room. (Previously we had a heavy dark oak table here and a sheepskin rug - photos here.) 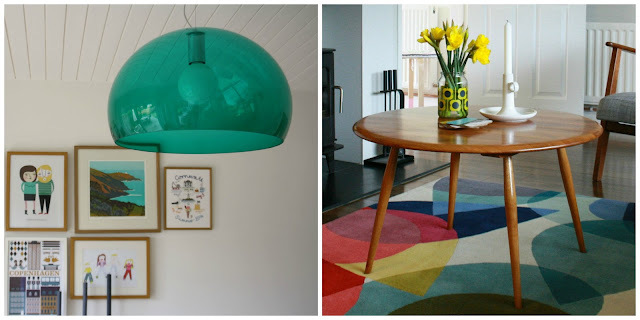 I can't begin to tell you how much I adore the joyful burst of colour and light these two items of furniture bring to the room. The beautiful rug* (spotted by John!) is full of colours that already exist in corners of this room and just draws them all together. It was an investment, the cost offset by the free coffee table, gift from a colleague who had no use for it. Sanded and varnished it looks quite lovely, and I love the spare elegance of the tapered legs and the way the light flows around it. I believe it may be an Ercol piece although I don't know that for certain. I don't really care to be honest, I just like it for what it is. To encourage cosiness (and not be sitting six metres away from the tv and stove) we moved the sofa into the middle of the room and created a seating area in front of the fire place. This also deliberately stops us walking across the middle of the room and it feeling like a corridor, and you walk around the back of the seating area instead. This felt strange at first because in every house I have ever lived in the sofa has been pushed up against a wall. Thank goodness I have a lot of throws and blankets to break up the expanse of grey on the back of the sofa. This corner below is where I sit if I want to sew in the evenings. The kids are also fond of this spot during the day and often choose to sit here with their legs dangling over the sides of the chair. This is the other wall, with the door to the dining room on the left. I think it would look fantastic covered with wall paper with perhaps quite a large repeating design. It is opposite the door to the entrance hall and the first thing you see when you open the door and enter the living room. I've mentioned the unusual, asymmetrical fire place design many times before. It's shape makes it tricky to style as you can't do the usual thing of picture/mirror/clock in the middle with something placed either side. It's not perfect and it's not "done" but I enjoy rearranging it constantly, propping up smaller pictures and changing the vases, candle sticks and bits and bobs with the seasons, and I have grown to love the design as part of what makes this 1968 house unique and wonderful to live in. The window is framed by IKEA Billy bookshelves either side which add some warmth to the space. It currently holds an old blanket chest full of board games and the rocking horse, and is mainly used as a play area. The train track or car mat are often brought in here and left up for days at a time. In December it held the Christmas tree. I do feel like this space could be better used, could have more purpose, but I'm not really sure how or what that would be. Perhaps play space for Bella and Angus is actually the best possible use for any space. I've mentioned before that I don't much like the overly shiny laminate floor, although it is good quality and there is nothing wrong with it bar the odd chip here and there, so there are no plans to replace it for now. In the future, we will move the ceiling light that currently hangs in the dining room into this room. I think the high ceiling could take it and it would look wonderful over the rug, echoing the shape of the circular coffee table below. That's a job for another day, along with painting the copper piping under the radiators and lots of other annoying fiddly jobs. It's a funny room though, all bright light or dark corners, an effect created by the extended front section with it's long, wide window and the sharp late afternoon light it catches, but that is what you get when you buy a 1960's style chalet house - interesting features and funny angles. * It is this one, in the smaller of the two sizes, for anyone who might be interested.